The Mopar performance catalog from Classic Industries brings you quality Mopar parts online for classic and newer model Chrysler, Dodge and Jeep models. Enter the Promo Code - C73MP - at checkout on the Mopar Parts by Classic Industries website. 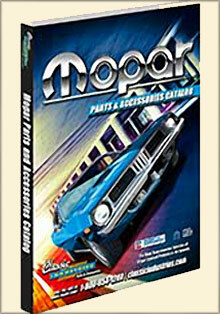 Mopar performance catalog - Need something for your Chrysler Dodge or Jeep? The Classic Industries selection of Mopar parts online has got it! Whether you want new floor mats or need to install headers on your HEMI powered Mopar, check out Classis Industries' Mopar parts catalog, or shop online to make your parts acquisition easier than ever and more affordable than ever. What is Mopar? - Before you shop for premium Mopar parts online from Classic Industries' new Mopar performance catalog, it might be helpful to understand exactly what the term Mopar means. Mopar (short for MOtor PARts) is the automobile parts and service arm of the DaimlerChrysler American brands Dodge, Chrysler and Jeep which basically means that Mopar parts are created by the same corporate teams that developed your Dodge, Chrysler or Jeep model, so they are designed to fit, perform and wear exactly to your vehicle. Chrysler Mopar parts online - Classic Industries brings you the most extensive and comprehensive Mopar performance catalog for Mopar enthusiasts that features hundreds upon thousands of Chrysler Mopar parts for your 300, 300C or 300M Chrysler as well as the Aspen, Concorde, Crossfire, Pacifica and others. From classic Mopar parts to new Mopar accessories for your PT Cruiser or Town & Country cars, they've got your parts ready and waiting. Dodge Mopar parts online - Enjoy all of the advantages of Mopar parts for your Dodge vehicles, including the highest-level materials, exact fit, correct colors and original equipment finish. Find Mopar restoration parts for your Dodge Caliber, Caravan and Mini Vans, Charger, Dodge Dakota, Durango, Intrepid, Sebring, Neon, Stratus, Nitro, Ram Truck, SRT-4, Viper and Challenger. Jeep Mopar parts online - Find the exact Mopar part that is vital for your next Jeep excursion in stock and in the pages of the Classic Industries Mopar performance catalog. Shop for restoration parts and Mopar performance parts for your Jeep Cherokee or Grand Cherokee, Commander, Jeep Wrangler, Liberty, Patriot or Compass while saving Jeep loads of money. The Mopar Parts catalog by Classic Industries brings you the leading selection of Mopar parts online as well as hard to find Mopar accessories and products from manufacturers such as Mopar Performance, Direct Connection, Competition Cams, ZEX Nitrous Systems, and the list keeps growing and growing. When you shop the Mopar performance catalog from Classic Industries you have the guarantee that what's under the hood will match what's on the hood, every time.